Looking for foot passengers – For the fainthearted . . . Walking through the picturesque Somerset town of Langport, one can cut from the church at the top of The Hill, past the old Saint Gilda’s Convent, and down Priest Lane to North Street. At some pint in history, there must have been some reason for the lane, though it is unlikely that any priest would walk along it now. The parish church is closed, the parish being absorbed into the parish of Huish Episcopi, which encircles it, and the church of which stands only hundreds of yards from Langport church. The old rectory, at the top of the hill, ceased to be a clerical dwelling decades ago. Priest Lane is more an alley than a lane, high walls line either side of it and it can be barely more than six feet wide at some points. Even as a pathway, it does not seem very frequented, though it is kept clean and its tarmac surface is well maintained. 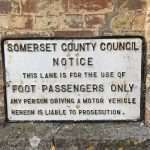 It seems an odd sign, what is a foot passenger? The Oxford Dictionary definition of the word “passenger” is “a traveller on a public or private conveyance other than the driver, pilot, or crew.” The prohibition is not against passengers of non-motorised vehicles; presumably one might pass down Priest Lane in a pony and trap or on horseback, but that would not make one a “foot passenger.” To be a foot passenger seems almost a contradiction in terms, how can one be on foot and simultaneously be a passenger? The sign would appear to be from times when prohibitions were taken seriously and when language was used in an exact way. What did they mean by foot passengers? The Oxford Dictionary definition of “foot passenger” is, “a person travelling on foot rather than by car, especially one taking a ferry:” it doesn’t offer any clarification. 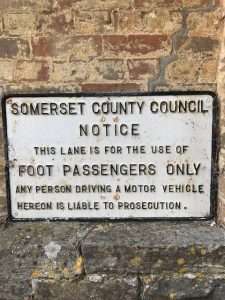 Langport is at some remove from the sea and a long way from the nearest ferry, a foot passenger going down Priest Lane had a long walk before they might actually have become a foot passenger. 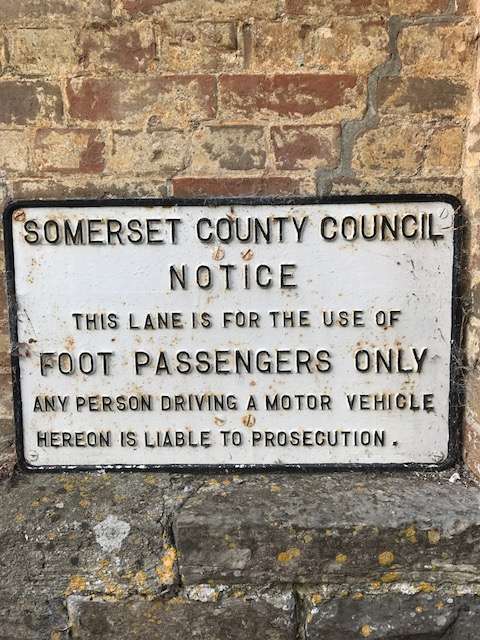 The county council official responsible for the sign undoubtedly had a precise meaning in mind when he chose the words for the sign: decades later it is baffling. OK. I had a decko on the google earth. It’s an odd contradictory little town. The church (s) seem to be in the wrong place, pointing to a refocusing of the town. And where’s the castle gate to go with the Portcullis. I note there are no small 18th century leftovers like you usually see here and in the south of England. What the estate agents call Artisan but was labourers in my memory. And how on earth did the Catholic church get build cheek by the CoE one. There is a road in the river meadow to the NW, likely to have forded the river more or less where the railway does now. But the most interesting things are the alignments of the river meadows in that area. They are very very close to the alignment of the houses along the road. Oh, you can be a foot passenger on a bridge too.